This image shows the Modulated X-ray Source, a key component in NASA’s first-ever demonstration of X-ray communication in space. Currently, NASA relies on radio waves to send information between spacecraft and Earth. Emerging laser communications technology offers higher data rates that let spacecraft transmit more data at a time. This demonstration involves X-ray communications, or XCOM, which offers even more advantages. X-rays have much shorter wavelengths than both infrared and radio. This means that, in principle, XCOM can send more data for the same amount of transmission power. The X-rays can broadcast in tighter beams, thus using less energy when communicating over vast distances. If successful, the experiment could increase interest in the communications technology, which could permit more efficient gigabits-per-second data rates for deep space missions. Gigabits per second is a data transfer rate equivalent to one billion bits, or simple binary units, per second. These extremely high-speed rates of data transfer are not currently common, but new research projects have pushed computing capability toward this range for some technologies. 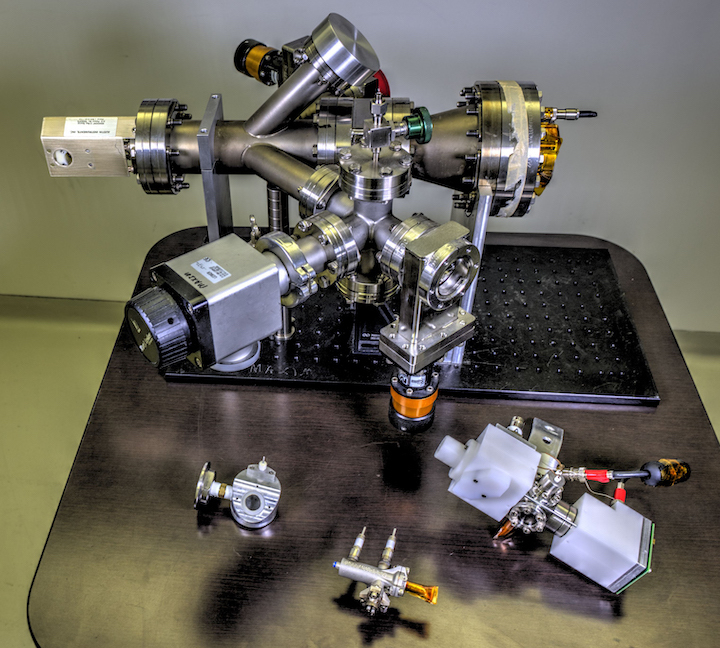 “We’ve waited a long time to demonstrate this capability,” said Jason Mitchell, an engineer at NASA’s Goddard Spaceflight Center in Greenbelt, Maryland, who helped develop the technology demonstration, which relies on a device called the Modulated X-ray Source, or MXS. “For some missions, XCOM may be an enabling technology due to the extreme distances where they must operate,” Mitchell said. Perhaps more dramatically, at least as far as human spaceflight is concerned, X-rays can pierce the hot plasma sheath that builds up as spacecraft hurdle through Earth’s atmosphere at hypersonic speeds. The plasma acts as a shield, cutting off radio frequency communications with anything outside the vehicle for several seconds — a nail-biting period of time dramatically portrayed in the movie, Apollo 13. No one has ever used X-rays in a communications system, though, so other applications not yet conceived could emerge, Mitchell said. “Our goal for the immediate future is finding interested partners to help further develop this technology,” Mitchell said. To demonstrate this new communications technology, NASA will use the MXS to generate rapid-fire X-ray pulses. Operated by another Goddard-developed computing and navigation technology called NavCube, MXS will turn on and off many times per second while encoding digital bits for transmission. From the experimental payload, the MXS device will then send the encoded data via the modulated X-rays to detectors on the Neutron-star Interior Composition Explorer, or NICER, which is located 165 feet away — about the width of a football field — on the space station. In this way, NICER becomes the receiver of a one-way X-ray signal. Although the first XCOM test will involve the transmission of GPS-like signals, Mitchell said the team may attempt to transmit something more complicated after the initial attempt. “It’s important is that we transmit a known code we can identify to make sure NICER receives the signal precisely the way we sent it,” Mitchell said. Although primarily built to gather data about the densest objects in the universe — neutron stars and their pulsating next-of-kin, known as pulsars — NICER was also designed to demonstrate advanced technology. In addition to the XCOM demonstration, the mission proved the effectiveness of X-ray navigation in space, showing in 2017 that pulsars could be used as timing sources for navigational purposes. During that two-day demonstration, which the NICER team carried out with an experiment called Station Explorer for X-ray Timing and Navigation Technology, or SEXTANT, the mission gathered 78 measurements from four millisecond pulsars. The team fed that data into onboard algorithms to autonomously stitch together a navigational solution that revealed the location of NICER in its orbit around Earth as a space station payload. Within eight hours of starting the experiment, the system converged on a location within the targeted 6.2 miles and remained well below that threshold for the rest of the experiment. NICER’s ability to carry out science and demonstrate emerging, revolutionary technologies has captured the attention of those planning NASA’s next era of human spaceflight. Missions that perform multiple functions are now considered a model, said Jake Bleacher, lead exploration scientist responsible for identifying areas where Goddard scientists can support human exploration of the Moon and Mars. The idea to use X-rays to communicate and navigate originated more than a decade ago when NICER Principal Investigator Keith Gendreau began work on enabling technologies for a proposed black hole imager aimed at directly imaging the event horizon of a supermassive black hole or the point of no return where nothing — neither particles nor photons — can escape. The idea was to establish a constellation of precisely aligned spacecraft that would in essence create an X-ray interferometer, an instrument used to measure displacements in objects. He conceived the idea of using X-ray sources as beacons to enable highly precise relative navigation. Using research and development funding, he developed the MXS. Gendreau then reasoned that if he could modulate X-rays through a modulator, he could also communicate, thus giving birth to the NICER three-in-one mission concept. The XCOM demonstration is managed by NASA’s Space Communications and Navigation program within the Human Exploration and Operations Mission Directorate. NICER is an Astrophysics Mission of Opportunity within the Explorers program. The Space Technology Mission Directorate supports the SEXTANT component of the mission, demonstrating pulsar-based spacecraft navigation.